Honey Ball is a rare fungus native to Drowda, Ellador and Fendarfelle. The fungus is known for having an alluringly sweet taste despite its strange color. In ancient times, Honey Ball was a tasty mushroom prized by the Drovv race. After the Cataclysm, the fungus was mutated and became even sweeter. After its discovery by various other races, it became a rare delicacy prized by merchants and reserved for the high class and nobility. Honey Ball was originally a rare fungus that grew from rotting wood in the northern subarctic regions, including Drowda, parts of Fendarfelle, and Ellador. According to the Drowdar elves, the mushroom was favored by the ancient Drovv who called it the "king of mushrooms" for its rich flavor. It was described as an aromatic mushroom with a taste akin to custard. 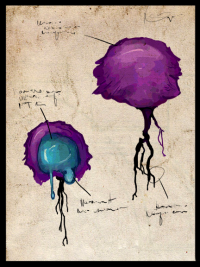 After the Cataclysm, the fungus was mutated into its current form: a purple mushroom ball containing a gooey blue liquid that was far sweeter than it originally was. The mushroom is now most common on Drowda, though rare populations have managed to sprout in Fendarfell and Ellador as well. Although Honey Ball was still edible, the Drowdar ignored it as their military lives did not allow for indulgence and the mushroom's sweet taste was considered worthless. A century after the Cataclysm, the Isldar of Ellador found the mushroom growing in their homeland. The Ice Elves took a liking to the mushroom's blue color and sweet taste. Due to a perceived religious significance, as well as the rarity of the mushroom, they considered the Honey Ball a sacred dessert item reserved only for their priestesses, matriarchal leaders, or warriors of great repute. Over another century later in 260 AC, the Ailor discovered the mushroom as well when the Regalian Empire sent colonists to settle on Fendarfelle. Though the mushroom's odd appearance raised alarm at first, it was slowly accepted as a delicacy prized by the wealthy. The mushroom is slightly more common on Fendarfelle than it is in Ellador, but still rare enough to make Honey Ball foraging a lucrative career. Efforts to farm the mushroom have met with little success as no one has been able to figure out a way to grow it. When the Ailor found out that Honey Ball grew more commonly on Drowda, bold merchants began travelling to that Forbidden Continent in order to trade resources such as weapons and armor to the Drowdar in exchange for the mushroom. Many have lost their lives in the process, whether due to the dangerous waters around the island or the monster that inhabit it, but those who make it have been able to reap great profits. Honey Ball is a fungus that colonizes dead and decomposing trees. Cutting into these fallen trees would reveal a stringy network of white mycelium with a slight purple tinge. Once mature, the fungus produces its distinctive mushrooms: a ball resembling a purple popcorn with a more smooth and glossy crust. This outer crust is thick and must be cracked to reveal the sweet gooey fluid inside. This prized substance has the same texture and consistency as honey, but with a cyan-blue color. Careful inspection of this honey reveals that it is cloudy as it contains the fungus' spores. A log colonized by Honey Ball fungus will usually sprout dozens of mushrooms once a year. Honey Ball is exclusively used as a high-end food source by both the Isldar and Ailor. The fungal honey has a sweet and creamy custard taste with a hint of earthy spiciness. The Isldar usually eat it straight from the mushroom ball. In the Regalia Empire, Honey Ball is an ingredient in various gourmet cooking, including both desserts and savory dishes where it can be used as a glaze or sauce ingredient. A single Honey Ball only contains about a teaspoon of honey so it is often mixed with filler ingredients such as normal honey or syrup. Dishes containing pure Honey Ball are exceedingly rare and very pricey. Raw Honey Ball is known to be so sweet that those who consume it will involuntarily smile. Only the wealthy can afford authentic Honey Ball dishes. It is common for imitation Honey Ball to be sold at a cheaper price to the lower classes. This is usually simply normal honey or even just sugar water and eggs mixed with blue dye. Many animals also enjoy Honey Ball, and some more territorial species are known to guard patches of the fungi for their own use. Tracking these animals is one way of foraging for the fungus. This page was last edited on 8 July 2018, at 09:29.